When MLS commissioner Don Garber visited Orlando City Stadium for the first-time last year, he hailed it as "a blueprint for the future" and no truer words were ever spoken, as it marked a high tide for soccer-specific stadiums. MLS teams have some incredible stadiums across the country but a growing number of beautiful soccer-specific stadiums with downtown locations have opened up in recent years. This growth exemplifies that soccer's popularity hasn't stopped increasing over time and sports betting has also benefitted from this, as you can find MLS odds for every game all season long. Although some teams still share stadiums with NFL or MLB teams, Atlanta United and the Seattle Sounders have proven that they can fill NFL-sized stadiums on a regular basis and as the years pass less and less teams will have stadiums deep in the suburbs or make-shift facilities. Recent history supports this projection, 12 years ago only four of the 12 MLS teams played in a stadium specifically designed for soccer and this year 18 of the 23 teams have soccer-specific stadiums. Now that 78.3 percent of the teams having true soccer venues, we decided to rank the top stadiums in the MLS. The atmosphere at Providence Park is unbelievable. Portland Timbers fans, commonly known as the Timbers Army, have helped create an incredible game day experience that rivals that of any sport across the United States. The fan base in Portland is dedicated, it has supported this team before it even entered the MLS, setting a new standard for fans in the rest of the league. Coordinated chants, incredible tifo displays and commitment to the team and community makes the Timbers Army phenomenal supporters. 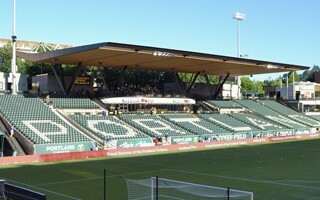 The Portland Timbers have sold out every game since entering the MLS in 2011 and Providence Park is centrally located in downtown Portland, providing easy access by public transit as well. It is an old, historic stadium, limited by a seating capacity of 22,000 but it will jump to 25,000 after recent renovations end in 2019, so the atmosphere will only get better once more fans are able to seat. If you're a soccer fan, you have to experience the game day atmosphere at this legendary stadium. Orlando City Stadium is one of the best places to watch soccer not just in the United States but in the entire world. This soccer-specific stadium is located just a few blocks from the heart of downtown Orlando and it was built with the intention of promoting an unrivaled atmosphere on game days. The stadium has the first safe-standing section in the United States so that the team's main supporters' group can root Orlando City SC non-stop and as loud as possible. The roof of Orlando City Stadium was built at an angle that traps in noise and the stands are designed so that fans can feel as close to the action as possible. Despite joining the MLS in 2017, Orlando City SC has a dedicated fan base that averaged 25,028 in attendance per game last season, ranking fourth in the league and the Orlando City Stadium atmosphere has a lot to do with this. Mercedes-Benz Stadium tops this list because it creates a game day atmosphere that can be compared to what is seen in stadiums in Europe. Atlanta United has a very rowdy, loyal fan base and this team drew more than twice the fans of most teams last season, averaging an MLS-best 48,200 fans per game last season. It helps that Mercedes-Benz Stadium is fantastic and new, located centrally in downtown Atlanta. This stadium is also the home of the Atlanta Falcons of the NFL but Atlanta United has proven that soccer fans can fill an NFL-sized stadium. There's a reason why this stadium will host Super Bowl LIII on February 3, 2019, it has set a new standard for game day atmosphere in the MLS ad it can motivate teams to increase the number of seats at their stadiums.